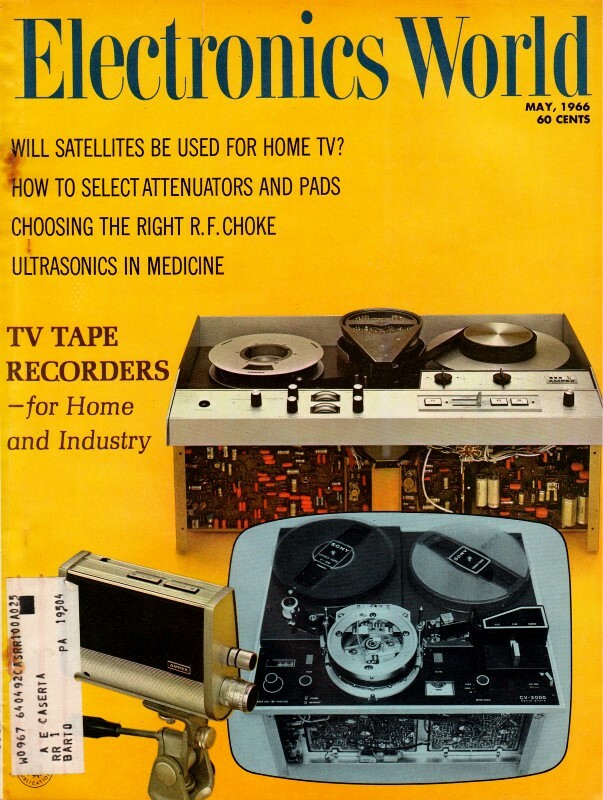 It would be more than a decade after the publishing of this article before the first direct-to-home satellite television broadcasts would be a reality, so it shows how long plans were being made for such systems. Rural landscapes are still peppered with the large vestigial C-band (~4 GHz) satellite dishes, many with faded eyeballs and other clever (and ugly) artwork on them. Before coaxial cable was strung beyond suburbs, country dwellers who either could not pull in over-the-air broadcasts from downtown locations or just wanted more viewing options paid dearly for satellite service. Equipment and installation costs on early systems could run into the $30k realm. Today's satellite TV systems use much smaller antennas operating in the Ku band (~12 GHz), with equipment and installation being free with a 2-year commitment. C-band DBS (direct broadcast satellite) systems are still available, BTW. This article is chock full of good engineering information. By Bradford B. Underhill / Arthur D. Little, Inc.
Our author began his professional career at the Harvard Underwater Sound laboratory in 1943. From the end of the war until 1949 he was Assistant Professor of Engineering Research at the Pennsylvania State Univ. and a Group leader of Electronic Research at the Ionospheric Research Lab. From 1949 to 1959, he was with RCA engaged in the development of advanced military systems using color television. Since 1959, Mr. Underhill has been a Senior Staff Member of Arthur D. little, Inc., an industrial research company with headquarters in Cambridge, Massachusetts. There he has participated in and directed studies aimed at assessing the technical-economic constraints on CATV, pay television, and ETV, and has provided consulting services in management, marketing, engineering, company policy, and corporate assessment to many companies. Can we use space satellites to broadcast TV directly to individual homes? What are the problems and can they be solved in the immediate future? Here are authoritative answers to these and other important questions. Editor's Note: We recently attended a financial seminar presented by the National Community Television Association, Inc. in New York City, During the all-day session over a dozen papers were presented dealing mainly with the financial aspects of CATV. Included were papers by Milton J. Shapp, president of Jerrold Corp., on the history, size, and relationship of CATV to the broadcasting industry; by Willard E. Walbridge, representing the National Association of Broadcasters, on the broadcaster's viewpoint; by Frederick W. Ford, former chairman of the FCC and now president of NCTA, on industry relationship with FCC and Congress; by E. William Henry, chairman of FCC, on the FCC view of CATV; and others. Among the most interesting and important was the talk on satellite broadcasting by Bradford B. Underhill. A portion of Mr. Underhill's presentation dealt with the possible use of satellites in connection with a CATV system. Of more general interest, however, were his remarks on the feasibility of using satellites to broadcast TV programs directly to our homes. This is a subject of widespread and increasing interest today, especially in view of the successful use of Telstar, Syncom, Relay, and Early Bird communications satellites. Because of its importance to our readers, we have excerpted below a large portion of Mr. Underhill's remarks. Clearly, if a television set coupled with a relatively simple, unobtrusive, and cheap antenna system at each home could, at anyone time, pick up over 100 different TV programs ranging from comedy through education, news, serious plays, and do-it-yourself material, we would have reached a very advanced state of communications. Even the ability to select 8 to 12 different and interesting programs would provide a new dimension to television, particularly if the selection were on a national or even international basis. Let's consider the practicality of the idea of using space satellites to broadcast TV directly to individual homes. Any communications system requires a source or transmitter and a receiver. In a satellite system, whether located on the ground or in the air, the satellite performs two functions; that is, it must receive signals from the primary transmitter or transmitters and then amplify and repeat selected signals to selected audiences. Conceptually, a space satellite can distribute signals on a grand scale. Consider a high-altitude space satellite that hovers over essentially the same spot on earth 24 hours per day, 365 days per year. It could receive signals from anywhere on almost one-half of the world and repeat this to the same portion of the world. One such satellite could cover all of North America, South America, and much of Europe and Africa. Two more could cover 95% of the populated world. Compare this with the 35- to 40-mile television reception available today. The comparison is staggering. Such a satellite, operating at an altitude of about 22,300 nautical miles, is called "synchronous" since it keeps pace with the earth's rotation. Another possibility imagines non­synchronous satellites operating at a much lower altitude say, 300 miles - which move with respect to the transmitter and receiving stations. In order to keep each satellite in view of its neighbors and the ground, at least ten such satellites would be required. Each would have to be tracked by appropriate ground stations and each would have to transmit to the ground as well as to its neighbors. In addition, each receiving station would have to track the satellites as they move across the zenith and acquire the next one as it becomes visible. We do not believe that such a system will prove feasible for home use, but concede that COMSAT or some such organization might be able to develop a base for non-synchronous satellite global communications with heavy government support. Assuming you will accept the loosely supported contentions as far as non-synchronous satellites are concerned, let us examine the case for synchronous satellites. Remember that this is a satellite that remains over essentially the same spot on earth and can receive signals from anywhere in its field of view and retransmit to that same wide area; roughly one-half of the world can be seen from such a satellite. A synchronous orbit is operationally desirable in order to avoid problems of pointing antennas toward the satellite and making contact with (acquiring) the satellite as it rises over the horizon. The satellite must contain a source of electrical power. At the present time, photovoltaic cells which draw power from sunlight are the commonest source of satellite power. Conventional batteries are nearly useless for long-time activity. In the future, nuclear devices capable of generating a substantial amount of electric power for long periods of time may be generally available for communications satellites. Until nuclear power supplies are available, transmitted power from a satellite will be severely limited, for a solar-battery power supply weighs about one pound per watt of continuous available power. control of the platform must be sufficiently precise to aim the antennas within appropriate tolerances. This problem is not insurmountable, but every sharpening of the attitude tolerances increases the complexity of the attitude sensor and control system and adds to the amount of energy which must be available for attitude control. The receiving ground complex consists of receiving antennas and receivers, that is, an amplifier and demodulator to convert the signal back to the preferred usable form. With the satellite in a practically stationary orbit, a complex control system is not needed to aim the ground antenna. where: dB = 10 log10 P1/P2 or 2x power = 3 dB; 10X power = 10 dB; 100x power = 20 dB. At first sight, the transmission properties of the link from the ground to the satellite look very much like those of the link from the satellite to the ground. The principal asymmetry is that in the up-link the transmitter is on the ground and the receiver is in orbit, whereas in the down-link the transmitter is in orbit and the receiver is on the ground. The state of our technology is such that we can install more powerful elements on the ground than we can in orbit. Practically speaking, this usually makes up-link performance easier to achieve than down-link performance, for a ground transmitter can be vastly more powerful than an orbiting transmitter, whereas a ground receiver can only be a little more sensitive than an orbiting receiver. Consequently, we shall examine the power budget for the down-link only. Frequency Assumptions, We will confine our discussion primarily to the existing television broadcast frequency bands at 54 to 88, 174 to 216, and 470 to 890 MHz. For specific numerical examples, we chose frequencies of 60, 200, and 600 MHz as representative of these three bands. Still higher frequencies, i.e., 2000-7000 MHz might be used but these would require expensive conversion equipment at each home. Radiated Power Assumptions: Where there is dependence on solar power, it is likely that the maximum continuous radiated power will not exceed a few watts, perhaps 10 watts at most. When nuclear or other power supplies are available, the primary power limitation is removed and the significant limit will arise from constraints on dissipation and life-time in the power output stages of the transmitter. We believe 100 watts radiated power will represent a likely maximum for the next decade. Under extreme conditions, power of 1000 watts may be attained. However, even with ground-based equipment, current technology does not attempt to achieve long life-time and high reliability in electronic circuit elements operating at power levels of even one kilowatt; reliability relies on replacement. The ordinary techniques of enhancing reliability by overdesign and derating are ineffective where high power throughout is required. These suggested limits are consistent with the guidelines cited by G.M. 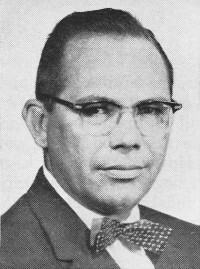 Northrup in a paper prepared for the Rand Corporation in 1963. Accordingly, I shall assume a total radiated power from the satellite of 100 watts except where otherwise stated. Satellite Transmitting Antenna Directivity: The effectve radiated power from the satellites can be enhanced 80 times (19 dB) with a directional antenna whose beam just illuminates the near-hemisphere visible from the satellite. An antenna 10 times as large will illuminate, in the temperate zone, an oval about 2500 x 4000 nautical miles, and will have a gain of 800 (29 dB). An antenna 10 times larger yet will have a gain of 8000 (39 dB) and illuminate an oval about 800 x 1200 nautical miles. 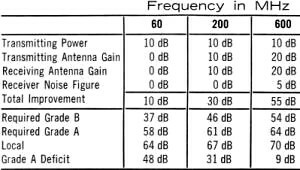 At the frequencies under consideration, however, these antennas are quite large, as shown in Table 1. Table 1 - Diameter of various high-gain transmitting antennas. Although very large antennas have been considered, we have as yet no experience in the erection and operational use of antennas even as large as 60 feet, to say nothing of antennas 10 times this diameter. Furthermore, a 29-dB antenna has a beamwidth of about 6°, and a 39-dB antenna has a beam width of less than 2°. The pointing of such a sharp beam adds a burden to the attitude control system of the platform. For the moment, let us assume the 19-dB antenna on 1 satellite and defer consideration of higher gain antennas until later. Path Loss: Because of the way certain standards of television signal strength have been developed, comparisons are facilitated by computing signal strength at the earth's surface directly in terms of received power density per unit aea for one channel. Let us assume that the 100 watts which is radiated through a 19-dB gain antenna is equally divided among 12 channels, each having a bandwidth of 6 MHz. The slant range from the satellite to the temperate zones is approximately 45,000 kilometers. On the ground the power density is: PD = 2.6 x 10-14 watt per square meter or 26/1000th of a micromicrowatt/meter2. 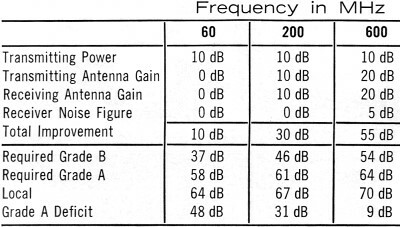 Receiver Antenna Directivity: The effective capture area of an omnidirectional antenna is shown in Table 2 for the various frequencies under consideration. A half-wave dipole antenna has 1.6 times (2 dB) more directivity, provided it is appropriately aimed. Combinations of reflectors and multiple dipoles can give gains of several decibels, but more substantial gains require structures whose size is comparable to those shown in Table 1. Table 2 - Effective capture area of omnidirectional antenna. An antenna with more than a few dB gain is likely to be large and expensive. Such antennas will probably be ruled out in applications where one would be required for each home television user. For the sake of comparison, further computations are based on the use of a non-directional receiving antenna. This factor can easily be modified by assuming some other antenna gain figures. From: Television Engineering Handbook," Donald G. Fink, ed. ; McGraw-Hill, N.Y. 1957, pp. 2-35. Noise assumptions: We have two bases for estimating noise limitation. On the one hand, we can use the grades of television service from the FCC regulations, as quoted in Table 3. Table 3 - Grades of television service and the FCC regulations governing them. For convenience, the power density in watts per square meter has been computed and exhibited alongside of the field strength. On the other hand, we can base signal-to-noise relationships on thermal noise and an assumption about the noise temperatures of the receiver and the associated environment. A set of such assumptions is shown in Table 4. Table 4 - Equivalent-noise assumptions for various sources. In order for the television receiver to function properly, the signal strength must exceed the noise by a substantial margin. The exact amount depends on the grade of service required and on the character of the noise. It will be assumed that a signal-to-noise ratio of 26 dB is required for satisfactory service and that 5 dB additional margin is required to allow for system degradation other than that arising in the down-link from the satellite. If the noise is white thermal noise this will result in a high-quality black-and-white television picture but one that is not totally free from visible noise effects. The sensitivity of color television to noise interference is somewhat greater. Resulting Margins: Table 5 compares the received signal strength, as computed above, with the FCC standards and with the performance of a low-noise receiver with a 100°K effective noise temperature connected through a non-directional antenna. The resulting figures are expressed in decibels and are all negative, showing the deficit in dB between the signal as it would be received from the satellite and the desired grade of service indicated at the head of the column. Table 5 - Deficit received power from a satellite system. Received power density in dB relative to various service grades. It is easy to see that the FCC Grade B Service is closely parallel in signal strength requirements to that required by a low-noise 1000°K receiver with an isotropic antenna. Those of you who have ever tried to operate a television receiver in an area with Grade B Service, so-called fringe-area reception know that with off-the-shelf home television receivers, the performance is very unsatisfactory without a directional antenna. In one way or another, the deficit of 33 to 70 dB must be made good. If a 1000-watt transmitter can be used aboard the satellite 10 dB can be gained at once. The transmitting antenna gain may possibly be increased 20 dB at 600 MHz and 10 dB at 200 MHz. At 60 MHz it is hard to see how this could be increased at all. A receiving antenna six feet in diameter will have a gain of 20 dB at 600 MHz and 10 dB at 200 MHz. At 60 MHz it is fruitless to attempt antenna directivity because galactic noise at 60 MHz is greatly in excess of 1000°K noise assumed for the receiver. The highly directive antenna would focus on sources of high galactic noise periodically during the earth's rotation and nullify the desired improvement. The receiver noise figure could be reduced somewhat provided a high-gain, low-side-lobe receiving antenna were used. 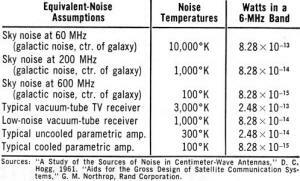 This leads to a complex and expensive system, and would probably be useful only at the 600-MHz frequency; for even at 200 MHz, galactic noise is a significant source of interference. Let us assume a possible 5-dB improvement at 600 MHz. Table 6 shows the total improvement achievable by these means. It is clear that success is possible only at 600 MHz and that the margin is slim. Even this success is bought at the cost of a 1000-watt transmitter, a 60-ft diameter antenna on the satellite, a 6-ft diameter receiving antenna with low side lobes, and a receiving system operating at an effective noise temperature of 300°K on the ground. We believe that such a low-noise receiver antenna system would add a minimum of $200 to the homeowner's cost. Even if we are overly conservative, a home conversion cost of at least $6 billion is indicated to convert current TV households to satellite receivers. Without further analysis, it appears that this is hopelessly expensive for the ultimate users of such television signals. Table 6 - Additional system improvements that are available. 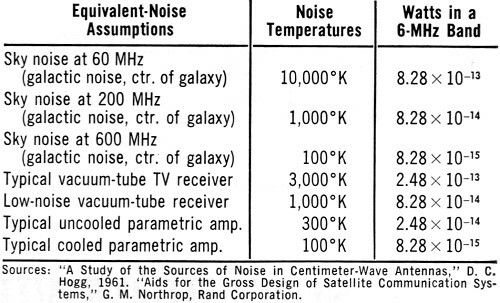 Sources: "A Study of the Sources of Noise in Centimeter-Wave Antennas," D. C. Hogg, 1961. "Aids for the Gross Design of Satellite Communication Systems," G. M. Northrop, Rand Corporation. Synchronous-altitude satellite radiating 100 watts divided equally among 12 channels through a 19-dB gain (full-earth coverage) antenna. (assumes 2.6 x 10-14­watt/m2 available; Table 3 power required, and Table 2 antenna gain) *19-dB transmitting antenna -26 dB S/N Into 1000°K receiver, 5-dB margin. Although the technical problem is made easier by going to frequencies above 2000 MHz, this would add the burden of conversion cost to the individual home owner and would still provide only marginal signal strength unless only a small portion of the earth were covered by the satellite. The 9-dB deficit at 600 MHz could be made up by reducing the number of channels transmitted to only one or by increasing the power to 10,000 watts. The first is not attractive and the second is beyond our capability at this time. There is no doubt that television transmission via satellite relay is technically feasible with a larger permanent ground antenna and receiver installation, but such installations cost many millions of dollars to build and hundreds of thousands of dollars per year to staff and maintain. Such installations would allow economic world-wide transmission and reception of a single TV channel and several radio channels and would be attractive to the broadcasters. Retransmission to homes would be achieved by relaying the received information to the individual homes via cable or local transmitters, Certainly governments might find such a system valuable for transporting information to other world centers or to developing nations. • Non-synchronous satellites would require trackers at each home. Large-scale CATV operators could conceivably develop a receiving system to track multiple satellites, but this would be an expensive undertaking. • Synchronous satellites broadcasting twelve channels to the home are not technically feasible below 200 MHz and are only marginally feasible at 600 MHz. Here expensive receiving equipment is required. • At frequencies between 2000 and 7000 MHz, trunking is possible but this would require expensive ground equipment that only the most affluent CATV systems could afford. • A feasible system would require at least a 20,000-watt continuous power source (more probably 30,000 to 40,000 watts of prime power would be required) and the development of high-power transmitting equipment that could operate reliably for many years. Neither development appears possible for many, many years.